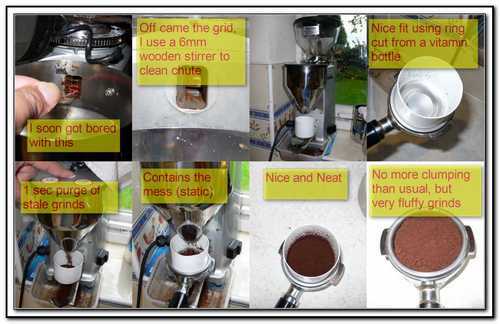 Many of us have the Mazzer Mini E grinder and a few owners have expressed dissatisfaction over certain areas. Even though my grinder doffs it's cap to me each time it hands me a portafilter of reasonably static and clump free grinds, I realise many of you are not so lucky. So what ticks me off about the Mazzer Mini E, well to start with it is a fine grinder and the most sensible at a reasonable price (nearly £500) for domestic use because it's small. However it does not appear to have been designed with the domestic consumers volumes of coffee in mind. Usage in the domestic environment which will never be as high volume as the commercial one and herein lies the problem. What started me experimenting was thinking about the Versalab and reading an owners thread on a forum I used to run. For many months I have noticed how it really takes around 3 shots to get the really good shot, unless your prepared to grind out a LOT of coffee each time you pull a shot. This is because the exit chute (the one with the little wire grid) in the picture below holds a significant amount of coffee. I estimate around 9g at least is in the chute and around the arms of the burrs waiting to get flung out into the portafilter. Of course when your going to make a coffee this stuff is stale and it also does not all come out at once (lift the lid of the funnel and watch!). The solution for me up to now has been to grind out 1 single shot, but that's not really enough, as I think around 2g of the coffee in the first and second shots is stale coffee which gradually works it's way out and by shot 3 it's all fresh coffee…..it's the reason why I usually have the 3rd shot if I have friends round. So grinding out a double to get rid of the stale coffee would be ideal, but that's a hell of a lot of coffee to waste if your pulling shots for one or two people at home (because it goes stale in the chute so quickly you have to grind out the stale coffee even after an hour!). I tried cleaning out the grinds behind the grid on a regular basis, but it was a difficult regime for someone lazy like me. I also wanted to explore what effect the grid was having ( had some suspicions)…….so I removed the grid. 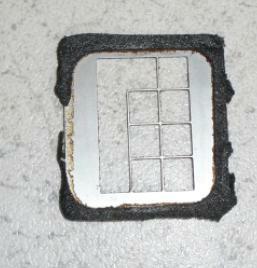 The grid is actually a metal square attachment with a wire grid within it and held on by some foam tape to the back of the steel funnel. Remove the funnel (2 screws) and simply cut around the edges of the square (you can see them beneath the foam tape and lift the grid away (I used a scalpel). If you are careful the grid can easily be re-attached if desired using some black electricians PVC tape. After removing the grid…wow I was in static city with grinds going everywhere as well as into the portafilter. Reminiscent of grinding very fine with Monsooned Malabar except much worse. BUT, clumping was much reduced, OK I didn't get much anyway, but now I didn't seem to be getting any…..what I was getting was coffee in the portafilter and the surrounding area. It's held on with some spongy tape. I suspected the grid was doing 2 things when I started this experiment. It causes the grinds to back up behind the grid, I suspect this is done on purpose by the designers, as it reduces static charges by forcing the grinds together after grinding. The trade off, is that although static is reduced, clumping is increased and stale grinds back up both behind the grid and in the burr chamber. I started grinding and everything went into the portafilter, no mess no problem, no clumps  well there is the odd clump, but they are "softer". After grinding remove the portafilter with the ring in place, tap lightly to level and remove the ring. Also the grinds were markedly fluffier and compressed more when tamped! I can now clean out the chute very easily and quickly without the grid in place, using a small wooden stirring spatula or one of those plastic ones (free at your local starbucks). The wooden stirrer is the same as you would find in any coffee-shop or Starbucks. The plastic ring I heated slightly one end over a gas flame and snugged it into the portafilter, let it cool and got a perfect fit. I think it's very important to say that although you may see a few clumps the character of the grinds is so different…fluffy, that the tamping and distribution feels so much better!. The results have been so good, much more consistent shots and far less wasted coffee…that I will never replace the grid! P.S. Much less coffee backs up into the burr chamber, because of course the grid isn't holding things up. [[module Comments hide="true"]] help | terms of service | privacy | report a bug | flag as objectionable Hosted by Wikidot.com — get your free wiki now!